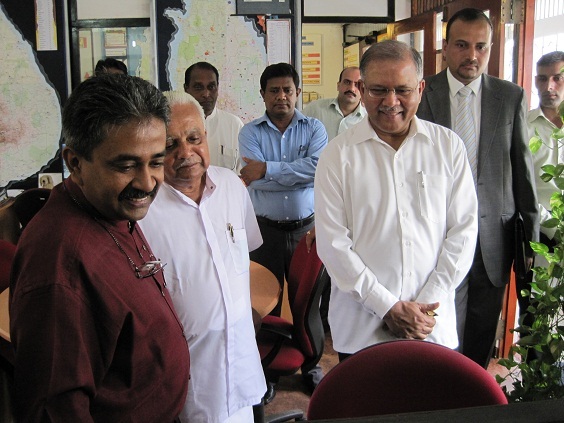 A visit from the Indian High Commissioner to Sri Lanka, H.E. 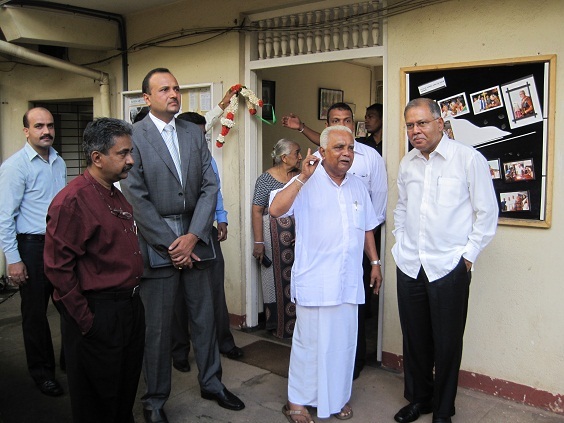 Ashok K. Kantha, to Sarvodaya’s Headquarters saw the diplomat tour the organizations’ numerous divisions. He visited and spoke with the staff of the ‘5 R’ unit, the Deshodaya (National Reawakening) unit, the Suwasetha preschool, the Masevena (teenage mothers) unit, the Shanti Sena Youth Peace Brigade and the Vishva Niketan Peace Centre. 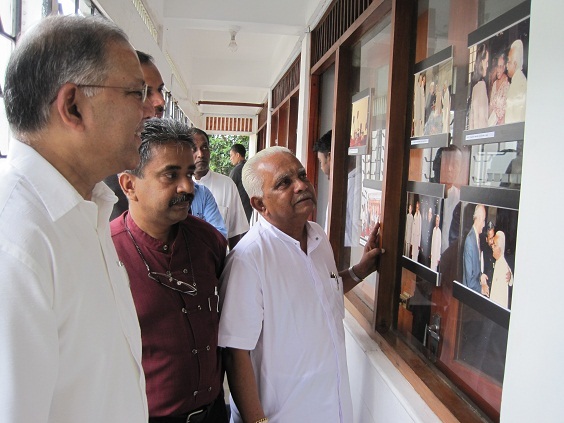 He was joined on his tour by the High Commissions First Secretary (Political), Anurag Srivastava. 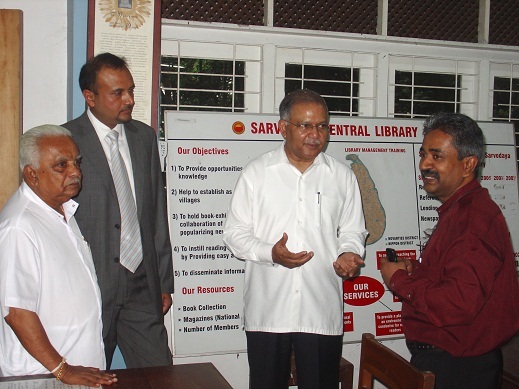 During his visit to Sarvodaya several Sarvodaya staff members explained the functions of the different units. The ambassador discussed the possibility of future cooperation between Sarvodaya and the Government of India with Drs A.T. and Vinya Ariyaratne. Although Mr. Kantha was familiar with some of Sarvodaya’s activities he described the range of Sarvodaya’s programs as ‘totally amazing’. He went on to praise both the movement and its founder, Dr. A. T. Ariyaratne, who has received many of India’s most prestigious awards. 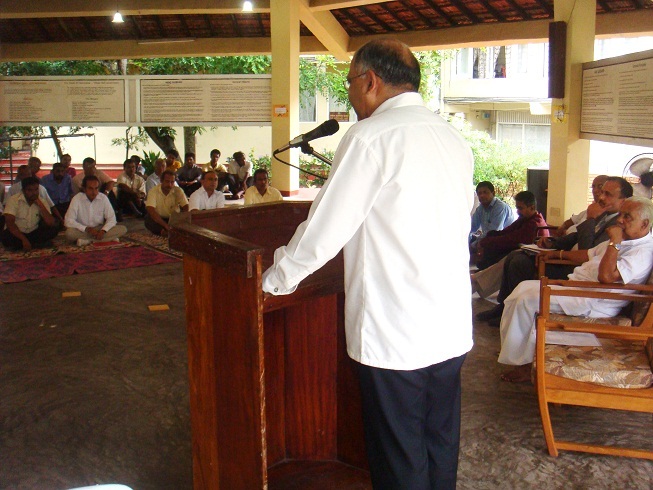 After a brief meditation session and speech by Dr. Ariyaratne, the High Commissioner delivered a short speech to Sarvodaya’s staff at a family gathering, he praised the Ghandian values of the organization, saying that one question he is often asked is, ‘Is Ghandian philosophy still relevant today?’ His answer is a resounding ‘yes’ and he remarked that Sarvodaya is the very embodiment of this answer. He went on to describe the value of the organization in a country that is pulling out of three decades of civil strife. He mentioned the value of bringing torn communities back together and the benefits of peace building. Describing himself as humbled by the organizations work he described it as ‘truly wonderful’. In the concluding remarks of his speech Mr. Kantha said he looked forward to a continuing relationship with Sarvodaya and promised to return very soon.